At last night's monthly Transit Coalition meeting, I presented the Metro's proposed "Bikes-on-Rail" policy which lifts the rush hour ban on cyclists but imposes a universal limit of two cyclists per rail car. I asked them to oppose the proposal and to support a robust and comprehensive appraisal of the Metro's capacity woes and to join me in pursuing a solution that benefited all passengers including cyclists. The ensuing conversation was the discourse that we deserve to hear at a Metro Board meeting. In fact, as I looked around the room at a Metro insider, an Amtrak insider, a couple of local municipal system insiders, a couple of political insiders and an array of transportation advocates representing several modes including cycling; I realized that the Transit Coalition was probably better qualified to run the Metro than their Board. Bart Reed went around the room, polling each participant on the Metro's proposal to limit cyclists. The responses went from wonky to simple common sense, but they were consistent in opposing the proposal and in pursuing a solution that would support the Metro's commitment to supporting all modes of transportation. Starting off with a review of the capacity projections that predated the Red Line to the length of the stations to platooning to headway limitations to rail car configurations, the experts quickly took us through many considerations that effect how and where people board the train, all of which simply confirmed that the Metro's current proposal was nothing if not hasty and ill-conceived. Participants reviewed other systems ranging from Moscow's subway to the Metrolink. Capacity calculations, bike rack configurations, bike cars, bike lockers at both ends, increased service, better connectivity and simply applying common sense to specific situations were all tossed out as solutions to the current capacity issues that Metro apparently hopes to solve by limiting cyclists to two per rail car. At the end of the great discussion Bart Reed polled the group and with no objections, positioned the Transit Coalition in favor of a policy that recognizes cyclists as customers and challenged the Metro to get in the business of moving people instead of simply moving buses and rail cars. It's evenings such as this that give me hope! Community leaders from throughout Council District 2 gathered this past Saturday and positioned issues such as Community Plans with teeth, Building & Safety enforcement, and Parking Policy as the foundation of a platform that will be used to frame the upcoming City Council Candidate forums and debates. Neighborhoods from throughout CD2 were represented as local voters gathered and hammered out a list of quality-of-life issues that they want established and developed during the campaign for the open City Council seat. The opening list of topics hit three dozen and then continued to grow during the breakout sessions before the group refined and combined and established a basic platform of positions that they hope will be the beginning of a basic framework of an issues-based campaign. Community Plans, Code Enforcement, Parking, Open Space & Recreation, the Budget, Transportation, Mass Transit, Solar Energy, the DWP, the City Charter, and the Neighborhood Council's relationship with the City and with the City Council were the final topics to make the cut. The specific actions are listed on the CD2 Vision Platform document which community members indicate will be the starting point for robust conversations during the campaign. It was obvious during the Saturday morning brainstorm session that the neighborhood representatives agree on the broad strokes but that many of the specific nuances are unique to individual communities. Through it all, it was apparent that there is a shared commitment to working together to developing an issues-based campaign and a real dialogue with the candidates based on commitments to the community and to the platform. At the end of the day, there was general consensus and the hope that two things had been accomplished; first that the CD2 Vision Platform would create an opportunity for Candidates to stand squarely on the issues as they position themselves in the campaign and second, that the election would then be the beginning of a working relationship between the seated Councilperson and the community, one that is based on the commitments made during the campaign and a mutual desire to improve the quality of life for everybody in CD2. 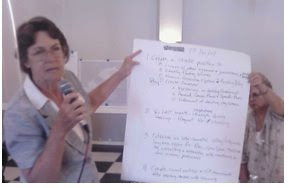 As for next steps, the sponsors of upcoming forums and debates have expressed hope that the CD2 Vision Platform will frame a robust dialogue between candidates and voters and that the ultimate result will be a positive working relationship between the prevailing candidate and the community that develops into even more ambitious commitment to improving the quality of life in CD2. Candidate shall ensure that community plans and specific plans are enforced and updated every 5 to 8 years with input from Neighborhood Councils and Community Organizations including but not limited to thorough assessment of infrastructure mitigations and cumulative effects. Candidate shall ensure enforcement by the Dept. of Building & Safety all applicable laws, regulations, building and safety codes in a prompt manner with the appropriate fines and follow up including but not limited to reporting offenders to the City Attorney. Candidate will establish an interconnected valleywide/citywide long term vision for recreation, open space, trails and public space by consulting and interacting with constituents and, when necessary, outside professionals. Candidate will implement Performance Based Evaluations and require Departmental Spending Accountability Reports throughout the City of Los Angeles. Candidate will establish a baseline of current traffic/transportation resources/challenges for CD2 and develop a plan that addresses future growth and the cumulative impact of future projects. Candidate will Incorporate Traffic/Transportation Planning in community Planning with focus on cumulative of development in CD2 and adjoining CD's. Candidate will provide an accurate report of current projects in CD2 and commit that future transit spending in CD2 more closely reflect the CD2 contributions to the transportation system. Candidate will implement multifaceted Solar Energy plan with competitive bidding, transparency, technological diversity, stakeholder choice of installer and product. Candidate will stop pass through of monies to City Council General Fund. Candidate will acknowledge and defend the rights of Neighborhood Councils and enforce the Charter mandate to have the NC's involved in the process. ● Candidate will develop and sponsor an amendment to require the Mayor to produce and the City Council to approve a balanced 3 to 5 year Plan. This is in addition to the Annual Budget. Candidate will meet regularly with NC's and HOA's and Community Groups in CD2, collectively and individually. Candidate will introduce a City Council resolution directing all city commissioners, at the start of each meeting, to verbally declare any conflict of interest issues with that session's agenda. CityWide in a park(ing) space near you! Council District 2 community members are convening a Town Hall this Saturday (July 25) morning at 10 am in order to lay down a community based platform that will drive the issues that frame the upcoming election for the open CD2 City Council seat. Community leaders from throughout CD2 will be presenting topics for consideration and stakeholders will have the opportunity to weigh in on the different "planks" and to shape the final platform that represents the issues and concerns of the campaign. Neighborhood Councils within the CD2 boundaries include Sherman Oaks, Van Nuys, Valley Glen, Studio City, Valley Village, Mid-Town NoHo, NoHo NorthEast, Sun Valley Area, Foothill Trails, and Sunland-Tujunga. The Town Hall meeting is open to the public and all stakeholders are invited to participate in the development of the CD2 Community Principles. CD2's City Council seat was vacated by Councilwoman Wendy Greuel who was recently elected LA's City Controller. More than a dozen candidates have filed with the City Clerk for the open seat and the campaign is already heading up with rhetoric that drifts from personalities to motives but rarely settles on the issues, concerns, and passions of the many neighborhoods that make up CD2. To that end, the CD2 Town Hall is designed to put the needs and desires of the community first, to frame the campaign with a real focus on the issues that matter, and to position the candidates so that the debates and forums start with a real foundation of vision and commitment to improving the quality of life in CD2. This past Sunday, a man leading a group of cyclists north on the Metro Gold Line (Highland Park to South Pasadena) encountered a Rail Operator who yelled at the group "Two bikes per car only!" and threatened to kick the cyclists off the train until cooler heads prevailed and the reality of an empty train on a Sunday morning allowed common sense to take over. The cyclists continued on their journey and the Rail Operator went back to being confused about the anticipated implementation of the controversial "Bikes-on-Rail" policy which would limit cyclists to two per rail car. The proposed policy went to the Metro's Operations Committee last week but Supervisor Mike Antonovich was prepared with a counter- proposal that directed the Metro staff to consider the legal implications of bikes, strollers, and luggage and directed them to prepare a report that should result in a "Stuff-on-Rails" policy. In spite of the fact that the proposed "Bikes-on-Rail" policy didn't clear the Metro Operations Committee, it appears that the Metro staff were excited enough about the opportunity to limit access to cyclists that they began free-lance implementation, complete with the obligatory yelling that comes with a commitment to safety. With this new commitment, one can only wonder if Rail Conductors will also be yelling at women with strollers, travelers with luggage, and recyclers with shopping carts or if it's just cyclists who will be targeted as the source of congestion on the Metro Rail. In spite of the failure of the proposed "Bikes-on-Rail" policy to pass GO, the marketing element appears to already be implemented … including signage indicating that bicycles, strollers and luggage are to share a specific area in the corner of each rail car is already appearing. Apparently, positive thinking runs freely in the Rail Division of the Metro, making up for the fact that common sense has run dry. This process seems to indicate that decisions were made, actions were taken, messages were communicated and the Metro team was ready to go, all in advance of Metro Board approval and all completely unencumbered by that pesky public participation element … the one that simply asks the Metro to actually consider the humans who depend on a robust Transportation System in order to conduct their business and get home to their families at night. It would seem that one of the simplest partnerships would be between the Metro and those passengers who want the Metro to be safe and effective. One would think that in a county of 10 million people, the Metro might be able to find one or two passengers who might have some useful insight into safety and efficiency and who might be willing to participate in the development of programs and policies that move the Metro toward becoming a robust Transportation System that supports all modes of travel. Even more specific to this situation, one would think that the Metro would have involved the cycling community in the development of a "Bikes-on-Rail" policy but such was not the case. All of which should change as a result of Operations Committee Chair Rita Robinson's direction to Metro staff that the cycling community be involved in the future development of the "Stuff-on-Rail" policy. Apparently there are cyclists who have actually traveled to other cities and even other countries and it didn't take long for the cycling community to advance solutions from around the world, including the popular "Bike-Car" that has the seats removed and allows those with bikes to efficiently travel without compromising capacity. With so many enviable Transportation Systems around the world, perhaps the best way to prevent the Metro Rail staff from taking their proposed step backwards would be to send them on a vacation, require them to travel, to visit other cities and to experience transit solutions that will allow them to return to LA full of commitment to a robust Transportation System that sets a world-class standard for safety and efficiency and equality. They might also want to checkout some communications systems. Might help get all of Metro on the same page. The Metro is proposing to take LA's cycling community for a ride, one step forward and two steps backward, all in a misguided effort to revise the Metro's bikes-on-rail policy. 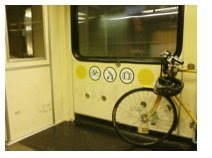 Current Metro policy prohibits cyclists from bringing their bikes on rail during peak hours (6:30 am - 8:30 am and 4:30 pm - 6:30 pm) a policy that is rarely enforced or even acknowledged based on the anecdotal presence of bikes on most Metro light rail during these hours. The Metro is proposing to remove the restriction, a simple action that should be hailed by the cycling community with cheers of "They like us! Right now, they really like us!" But a quick survey of the eight-page handout for the proposed policy revision revealed the small print, the details, the motivation for the out-of-character "What have we done for the cycling community lately?" posture of the Metro. Under the "enhance safety" bullet point, the Metro addressed safety by slipping in a universal limit on cyclists with a two bikes per rail car limit. This means that the last Red Line train from NoHo in the middle of the night, one that typically has two cars, would be limited to 4 cyclists. The late night trains are typically light on passengers but heavy on bikes. It also means that during busy times, cyclists would be racing back and forth on the platform with their bikes, counting cyclists and looking for the "light" rail car. Hardly a safety improvement on the platform! There are a couple of significant issues here, bigger than the simple specifics of where the bikes go and how many fit. 1) Bikes are a form of transportation. Cyclists are able to get around the city and fill Metro service gaps because of their bikes. Metro passengers are able to get farther and to fill service gaps because of their bikes. We should be supporting the potential synergy here, not limiting its efficacy by excluding cyclists with limitations that apply to no other user group. Mike Cannell, the General Manager for Metro Rail Operations, explained that with the increase in ridership on the Metro Rail, space has become increasingly scarce. Good point. He pointed out that with the success of the Flyaway from the airport, more and more passengers are taking luggage on the Train. Good point. He pointed out that when you add strollers, carts and ... gasp ... one time he saw a guy with a Christmas tree, we're really now all competing for limited and finite space. Good points! BUT...bicycles are a transportation solution. When the guy can ride his Christmas tree from the train station to his home, it should be in the same category as the bicycle, but until that day, bikes support and enhance the Metro Rail service as a form of complementary, not just alternative, transportation. All else is "stuff" and to limit bicycles to two per car while not limiting strollers, wagons, luggage, and other personal property demonstrates a clear attitude of "What are we gonna do with all of these cyclists?" Cannell continued by pointing out that the presence of "all of these bikes" was a violation of the fire and penal codes because of the blocked doorways. He was asked if It was the "blocked doorways" that was the violation or if it was "the bikes blocking the doorways" that was the violation. He responded that it was the bikes. When pressed, he repeated that the prohibition was against bikes, not people or luggage or strollers or Christmas Trees, but against bikes. Cannell's team pointed out that the space on a rail car is finite and a bike takes up space, thereby reducing Rail Car capacity. Cyclists countered, "By riding a bike, cyclists complement the Metro and close service gaps in the system, thereby increasing Transportation System capacity!" Crickets chirped when the Metro staff was asked if anybody had actually counted cyclists on buses, on rail, and on the streets and if there was any information or data to support this discussion and the proposed policy recommendations. The Metro doesn't count cyclists because, apparently, cyclists don't count. 2) The Metro has an identity crisis. Anyone who visits the Metro with any regularity is reminded of the old tale of the Elephant surrounded by the blind men. Essentially, six blind men were asked to determine what an elephant looked like by feeling different parts of the elephant's body. The blind man who feels a leg says "It's like a pillar!" The one who feels the tail says "It's like a rope!" The one who feels the trunk says "It's like a tree branch!" The one who feels the ear says "It's like a hand fan!" The one who feels the belly says "It's like a wall! The one who feels the tusk says "It's like a solid pipe!" The Metro is the proverbial "elephant." The Train folks exclaim "The Metro is a Rail System supported by bus connectivity." The Bus Operations folks exclaim "The Metro is a Bus System that saturates the region with connectivity but competes with Rail for operating funds!" The Training folks exclaim "It's a conflicted environment with everybody in our way!" The Real Estate folks exclaim "It's a development opportunity supported by transit!" The Parking Lot folks exclaim "Seriously, look around. It's a parking lot supported by transit!" The Outreach folks exclaim "It's an opportunity to engage and to create community!" The Pedestrian folks exclaim "Hey, where's the elephant?" The Bicycle folks exclaim "Don't anger the elephant!" Through it all, the local municipalities and agencies look at the elephant and see an ATM that's gonna dispense $40 Billion of Measure R money over the next 30 years, all to projects based on the Metro's priorities and oversight. The Metro, by design, is our Regional Transportation Authority. It's an "elephant" and all of "the blind men" are correct. It's many things, but first and foremost, it is responsible for creating and funding a Transportation System that services all modes, using all methods and moving all people. Federal funds along with Measure R funds put the Metro in a significant position of power and the character of our regional Transportation System is due to the priorities that are established at the top. The Metro funds everything from freeways to bike lanes to educational materials to the trees that make it more pleasant to walk to the bus stop. Based on results it is evident that the Metro has meandered in its commitment to creating a Transportation System with a "multi-modal" commitment to moving people. There is hope that this is going to change. The Metro has a new CEO, Art Leahy, and a new Chairman of the Board, Ara Najarian, both of whom have a reputation for innovation and a commitment to civil service. 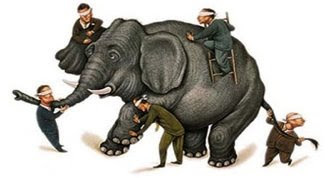 Leahy and Najarian now have the opportunity to work together to integrate the many opinions of "the blind men" into a cohesive vision and mission for "the elephant." It's on them to create a real regional Transportation System that is committed to moving all people using all modes and that is committed to improving the quality of life for our communities. Their first challenge is on the horizon and will come up this Thursday in the Operations Committee when the limit of the number of cyclists comes up for a vote. As Cannell puts it, "This system wasn't built with cyclists in mind."